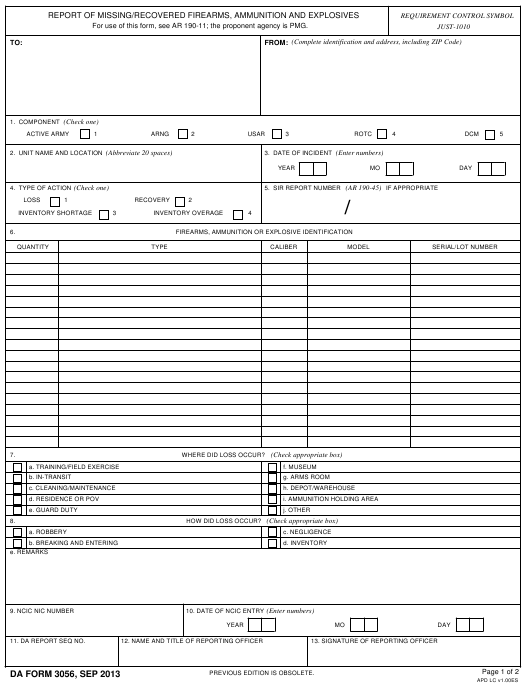 DA Form 3056 or the "Report Of Missing/recovered Firearms, Ammunition And Explosives" is a Department of the Army-issued form used by and within the United States Military. The form - often incorrectly referred to as the DD form 3056 - was last revised on September 1, 2013. Download an up-to-date fillable DA Form 3056 down below in PDF-format or look it up on the Army Publishing Directorate website. For use of this form, see AR 190-11; the proponent agency is PMG. 11. DA REPORT SEQ NO. carelessness on the part of the person(s). ventory overages, see item 8d. another page will be used. into storage facility, POV, home, club, etc.